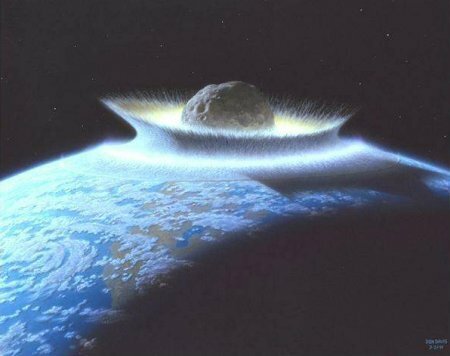 In order to cause the extinction of human life, the impacting body would probably have to be greater than 1 km in diameter (and probably 3 – 10 km)….It is estimated that a 1 km or greater body collides with Earth about once every 0.5 million years. So it is not that unlikely as many people think! May be it is useful to raise awareness for this danger. For large hazards or short lead times, nuclear detonations are the only possible mitigation option in the near future. In terms of sheer efficiency, a nuclear detonation will provide the most ∆V for the least amount of weight of any system proposed here, given reasonably short mission times. No other device currently proposed can release the kind of energy per mass that a nuclear device can. The non-nuclear technologies discussed provide an array of options for smaller bodies. Propulsive technologies such as chemical, electric, solar sails, directed energy, and mass drivers would only be effective against smaller bodies. For larger bodies the amount of fuel needed would become too large to launch into orbit. failure could cause extreme amounts of destruction. However, because of the current state of technology, not a lot of modifications would be needed to upgrade current weapons from their military role to one of hazard mitigation. As a result, there exists a population of “near-Earth asteroids” (NEAs), which poses a small but real hazard to civilization. Contributions to the design, development and execution of relevant space missions, such as Rosetta, Dawn, AsteroidFinder, Don Quijote, ASTEX. Observations of near-Earth asteroids with space-based and ground-based telescopes, such as the Spitzer Space Telescope, NASA Infrared Telescope Facility, with the goal of characterizing their physical properties. The maintenance of a database of near-Earth asteroid physical properties, such as size, shape, rotation state, taxonomic class, etc. (EARN). The development of models, e.g. thermal models, of asteroids and comets to facilitate the interpretation of observational data. Studies and modeling of the effects of impacts on the Earth. An on-line data-base of Physical properties NEOs, with the corresponding bibliographical references is available for each individual NEA. This data-base, compiled and maintained at DLR by Gerhard Hahn, contains information on all known near-Earth objects (Atens-Apollo-Amor Asteroids), and is updated on a regular basis. So there is someone having an eye on these objects! ESA today inaugurated a new hub that will strengthen Europe’s contribution to the global hunt for asteroids and other hazardous natural objects that may strike Earth. ….. The NEO Coordination Centre will serve as the central access point to a network of European NEO data sources and information providers being established under ESA’s Space Situational Awareness (SSA) Programme. ESA’s NEO Coordination Centre (NEO-CC) is operated by Space Dynamics Services S.r.l. (SpaceDys) under a contract with Elecnor Deimos, Spain, on behalf of the Agency’s SSA Programme Office. So do you think aliens are no threat? Have you seen this report in the New York Times about this telescope scanning for extraterrestial life (via boing boing)?